and health topics for academic, popular, and community-based publications. 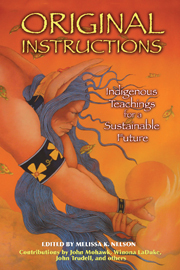 My first book, an edited anthology, Original Instructions – Indigenous Teachings For A Sustainable Future was published in 2008 (Inner Traditions / Bear & Company). I edited this book from Native American talks given at the Bioneers Conference over the past fifteen years. Contributors include the late John Mohawk, Chief Oren Lyons, Winona LaDuke, Jeannette Armstrong, Katsi Cook, and John Trudell. 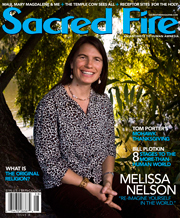 Read "Instructions for a Healthier Planet"
Melissa K. Nelson, Ph.D. enjoyed a productive academic year 2010 – 2011 serving as the Anne Ray Resident Scholar at the School for Advanced Research in Santa Fe, NM and is happy to be back at AIS, SFSU full-time for academic year 2011 – 2012 and working at the Cultural Conservancy. for World of Indigenous North America edited by Roberto Warrior (Routledge 2012 - 13). and is in discussion with publishers. One of Nelson’s previously published essays, “Becoming Métis,” was re-published in The Colors of Nature – Culture, Identity, and the Natural World edited by Alison Deming and Lauret Savoy (Milkweed Editions 2011). Edward M. Luby and Melissa K. Nelson. 2008: Rivers of Memory, Lakes of Survival: Native American Water Traditions and the Anishinaabeg Nation. Edited by Alison Deming and Lauret Savoy, Milkweed Press. In Deep Blue: Critical Reflections on Nature Religion and Water. Edited by Sylvie Shaw & Andrew Francis. To be published by Equinox Publishing, London, England. '"Decolonizing Our Bodies / Nourishing Our Spirits” – American Indian Health Recovery in the 21st Century. Special Issue of the American Indian Culture & Research Journal, University of California, Los Angeles. 2006: Oral Tradition, Identity, and Inter-generational Healing Through the Southern Paiute Salt Songs. In Cultural Representation and Contestation in Native America. 2006: Ravens, Storms, and the Ecological Indian at the National Museum of the American Indian. 2002: [Reprint] Becoming Métis. The Colors of Nature – Culture, Identity, and the Natural World.